In this edition, I will explore a few areas of importance to scientists, particularly women scientists, and the value of planning for a healthy financial future. First and foremost, we should acknowledge that as scientists we take longer to reach our full earning potential. The amount of education required to become a Scientist (which can include undergrad, graduate and one or several post-doctoral studies) consumes a large amount of our early earning years. 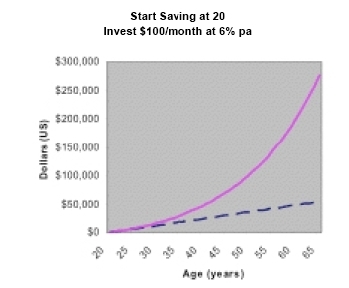 If at 20 you started saving or instead waited until the end of a couple of post-docs – what impact do you think this would have on your ﬁnances at 65 (assume 6% interest)? 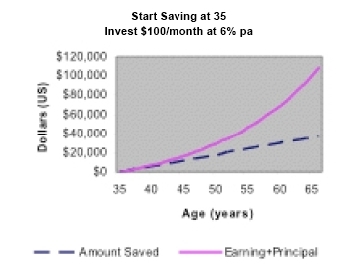 Although the amount you save is important as is the interest rate, time has a compounding impact on your investments. These charts are meant only to remind us that late entry into the formal workforce leaves us with less time to catch-up on our long term ﬁnancial goals. In addition, we will enter the workforce during a ﬁnancially demanding phase of our lives when we are both developing our careers and our families. Scientiﬁc endeavors can also be inherently risky. Our lab work exposes many of us to unknown risks. When we graduate our greatest asset is our knowledge, creativity and our ability to learn and digest information. Without realizing it, we may be exposing this most valuable asset to risk. To properly manage risks at different stages of our lives we need a clear understanding of our current ﬁnances, our family needs and our future goals. Statistically, women are still shown to outlive men and must plan for a longer work or retirement life. Moreover, in our society women often take on the role of caretakers – caring and planning for their kids, elderly parents and their own future. As scientists we can use ﬁnancial plans to coordinate all of our resources to meet life challenges on our own terms. Not planning will leave women disconnected and at the mercy of the changing realities with parental care, home costs, education costs, investment market changes, career consequences, relationship changes, health issues and meaning of life issues. Throughout my career I seldom worked 9 to 5 – you might be the same?! I was in and out of the lab at all kinds of hours. And when not in the lab, I was striving to keep up with the most recent articles or planning for the next phase of my life. Later, I spent long hours working through business and government systems to accomplish my career and personal goals. During this time our finances should be working in parallel so we have the buffer to live life on our terms. Often we delay, putting off critical ﬁnancial decisions until we can ﬁnd enough time to research all the possible avenues, study them thoroughly, and make a balanced well-reasoned decision. The devil is in the details, after all. Our analytical approach can lead us to seek a lot of data and explanations before we feel conﬁdent enough to commit to a particular ﬁnancial course of action. Scientists can be ﬁrst-class over-thinkers – unable to see the forest for the trees! Then we wonder how others who work 9-5 can retire at age 55, put two kids through college and travel to Italy every summer with such apparent ﬁnancial ease and nowhere near our education. Our ﬁnancial resources need to be harnessed and shaped early, just like our education so that it can grow as we grow our careers. It is never too early to take stock of ﬁnances, review our goals and align the two. Moreover, as scientists we are fortunate in that we are exposed to many investment and earning opportunities: 401K, stock plan, employee plan, alternative investment, new venture and venture capital. Matching these opportunities with our life goals will enrich our ﬁnancial life and add ﬂexibility to our personal and professional life. Our career choices are many and each has implications. It is to our advantage that we understand the math and the logic behind complicated risk and investment decisions. Understanding those implications combined with a pro-active and informed approach on investment and financial issues can best help us reach our goals. As women scientists, our greatest asset is that we are intelligent, well educated, life-long learners – let’s align our financial health with our career and life goals so that we can reach our maximum potential in our chosen lives. Since we often also contribute to our community’s well-being, planning early and clearly for our family’s financial future will allow us to meet our personal, professional and philanthropic dreams.